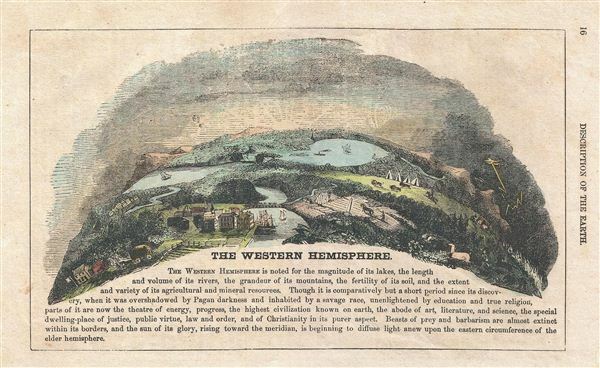 A beautiful and usual panoramic view showing views of rivers, mountains, farms and buildings typical of the New World, spans over text describing the Western Hemisphere and its 'savage race' and 'beasts of prey and barbarism,' which the text reassures us are all now subdued by 'the highest civilization known on earth.' Reads almost like a realtor's hopeful advertisement-- 'Come to the New Country-- it's not dangerous anymore. Really!' Contains a description of the earth on verso, with a charming illustration of a Mohekan Indian and a european standing on either side of a globe. Published as pages 15 and 16 in an unknown source.